Morayshire Combination comprised the 18 parishes of Aberlour, Alves, Bellie, Birnie, Boharm, Dallas, Drainie, Duffus, Elgin, Forres, Kinloss, Knockando, New Spynie, Rafford, Rothes, St Andres-Lhanbride, Speymouth and Urquhart. They were later joined by Botriphnie. The total population of the member parishes in 1881 was 41,285. The Morayshire Combination poorhouse was built in 1863-4 at Bishopmill to the north of Elgin. The architects were Alexander and William Reid. The site location and layout are shown on the 1905 map below. A single-storey entrance block stood at the south of the site. This probably contained the porter's quarters, a committee room, and possibly an office for the relieving officer. A walled path led to the main building which had the H-shaped layout found in many poorhouse. The larger block at the front was a corridor plan building with a central portion which would have contained the Master's quarters. The poorhouse dining-hall and chapel were located in the central range at the rear. The two wings of the front block contained male and female accommodation, probably with the aged at the front side and able-bodied or "dissolute" inmates at the rear. In the rear range of single-storey buildings were found various work and utility rooms including a laundry on the female side. Morayshire former workhouse site from the south, date unknown. 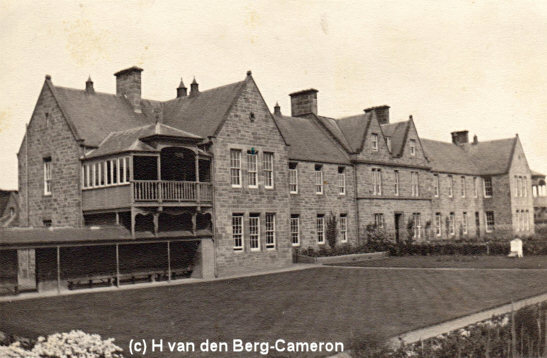 The buildings were demolished in 1974 and a school now occupies the site. All that remains is a portion of the wall that lay between the entrance and main building. Morayshire former workhouse site from the south-east, 2001. In addition to its participation in the Combination, the parish of Knockando operated had its own poorhouse or almshouse. This establishment was administered by the Parochial Board rather than operating as a statutory poorhouse under the central Board of Supervision. The poorhouse was located at Upper Knockando, just to the east of the Bridge of Capnach. It is identified as a poorhouse on the first edition Ordnance Survey map of 1871, but not on the second edition of 1905.